Historical Italian leading company in the syrups field. The main manufacturing base is in Anzola dell'Emilia: 30 thousand square meters, which you can easily identify at the entrance thanks to the classic blue and white giant pot. In Anzola the factory employs 250 workers, engaged in a range of 1,200 products for gelato and pastry shop. The founder of the company is Gennaro Fabbri who entered in 1905 the field of distillation. He soon distinguished himself both for his innovative products and for the original containers. In the Twenties began the production of alcoholic and non-alcoholic syrups. It was during this period that Fabbri came out with the company’s most famous product, initially called “Marena con frutto”, inspired by a recipe of his wife, Rachele Buriani. 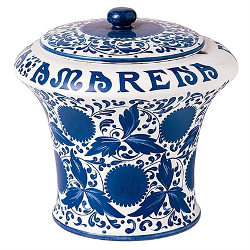 Originally sold in demijohns, the Amarena brought great fame and fortune to Fabbri with its unmistakable white and blue ceramic jar, made by a ceramic artist from Faenza, Riccardo Gatti and created as a gift to his wife in order to thank her for the creation of the new product. The 1930s marked the arrival of cherries in liqueur and the expansion of the product range to including preserves, the only one production that was allowed during the war. During the post-war years and ensuing economic recovery, the launch of a new product gave Fabbri yet another resounding success: the “cremolato”, i.e. the compound pastes in the classic creamy flavours and in the fruit ones used to make gelato by simply adding water or milk. This is a market niche in which the company remains the undisputed leader. Nowadays many Fabbri's business units operate in Argentina but also Brasil and Germany. The sweet Italian-style won over 100 countries around the world. Fabbri Master Class is active from 1997 with the Permanent International professional school which provides high-level training for gelato makers, pastry chefs, bartenders and baristas abroad, while making a great contribution to promoting the art of Italian cuisine.